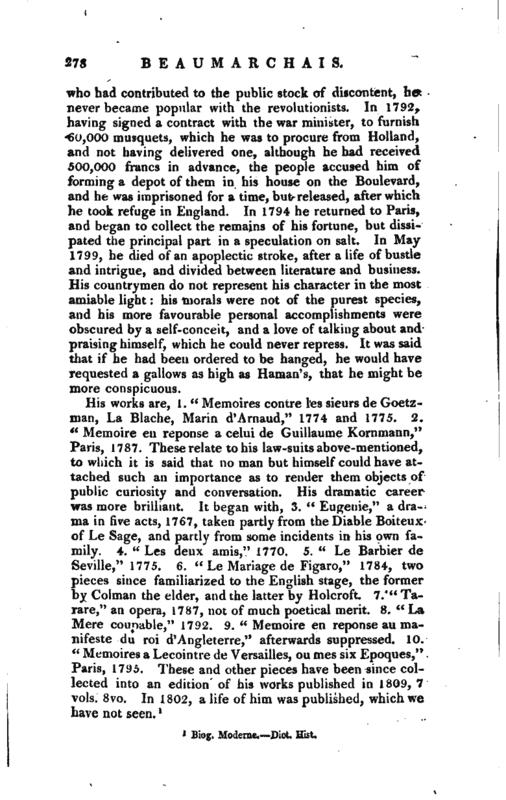 , a French dramatic writer of modern celebrity, was born at Paris, Jan. 24, 1732. His father was a watchmaker, and at the age of twenty-one himself invented an improvement in watchmaking, which being contested by an eminent artist, was decided in favour of young Beaumarchais by the academy of sciences. Being passionately fond of music, and especially of the harp, he introduced some improvements in this instrument, which, with his excellent performance, gained him admittance to Mesdames, the daughters of Louis XV. to give them lessons, and this was the origin of his fortune. He lost two wives successively, and then gained three considerable law-suits. The papers which he published concerning each of these causes, excited great attention. He had also an affair of honour with a duke, in consequence of which he was sent to Fort L‘Eve’que. He was afterwards employed in some political transactions by the ministers Maurepas and Vergennes. 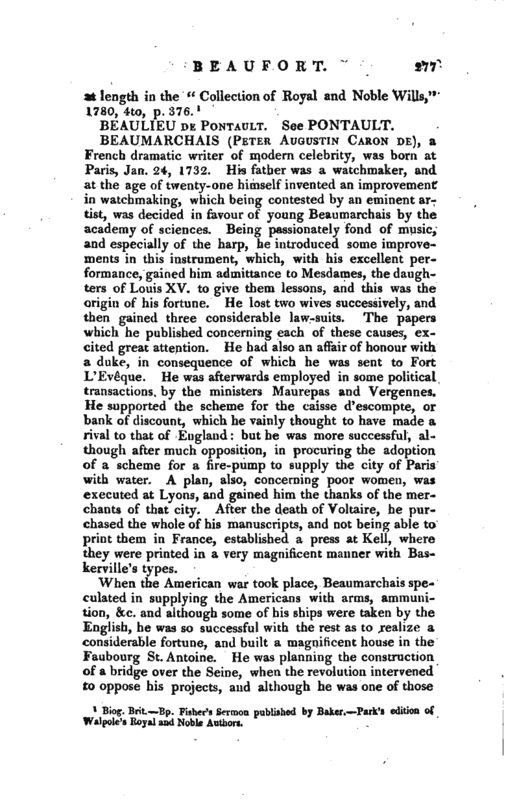 He supported the scheme for the caisse d’escompte, or bank of discount, which he vainly thought to have made a rival to that of England: but he was more successful, although after much opposition, in procuring the adoption of a scheme for a fire-pump to supply the city of Paris with water. A plan, also, concerning poor women, was executed at Lyons, and gained him the thanks of the merchants of that city. After the death of Voltaire, he purchased the whole of his manuscripts, and not being able to print them in France, established a press at Kell, where they were printed in a very magnificent manner with Baskerville’s types. When the American war took place, Beaumarchais speculated in supplying the Americans with arms, ammunition, &c. and although some of his ships were taken by the English, he was so successful with the rest as to realize a considerable fortune, and built a magnificent house in the Faubourg St. Antoine. He was planning the construction of a bridge over the Seine, when the revolution intervened to oppose his projects, and although he was one of those | who had contributed to the public stock of discontent, he never became popular with the revolutionists. In 1792,. having signed a contract with the war minister, to furnish 60,000 musquets, which he was to procure from Holland, and not having delivered one, although he had received 500,000 francs in advance, the people accused him of forming a depot of them in his house on the Boulevard, and he was imprisoned for a time, but released, after which he took refuge in England. In 1794 he returned to Paris, and began to collect the remains of his fortune, but dissipated the principal part in a speculation on salt. 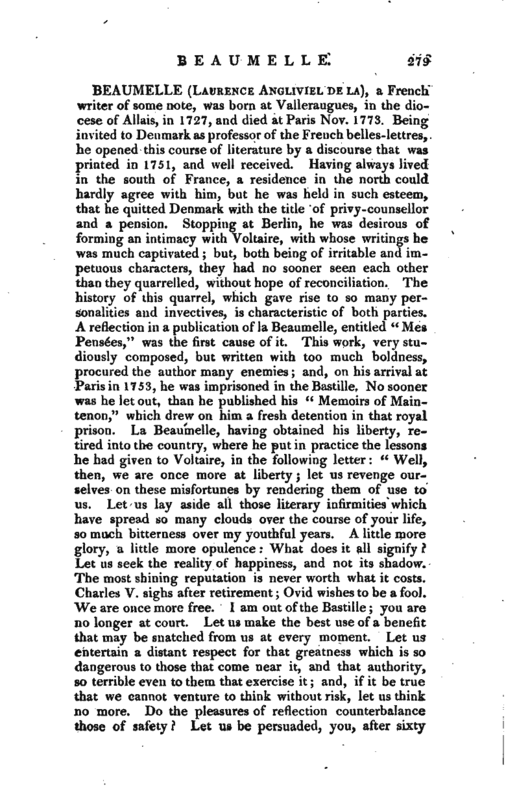 In May 1799, he died of an apoplectic stroke, after a life of bustle and intrigue, and divided between literature and business. His countrymen do not represent his character in the most amiable light: his morals were not of the purest species, and his more favourable personal accomplishments were obscured by a self-conceit, and a love of talking about and praising himself, which he could never repress. It was said that if he had been ordered to be hanged, he would have requested a gallows as high as Hainan’s, that he might be more conspicuous.